there’s always a nagging feeling that there’s something missing. By the time Jeremy got to his Web Design class they were in the middle of a discussion of fonts and on-screen readability. He waited to turn in his late slip until after class so he wouldn’t interrupt Mr. Everington’s lecture. When the class was over he headed to his seventh period Communications Studies class. He had to laugh to himself. The lesson was about the selection of fonts and readability in various types of media. He wondered if the teachers had coordinated their study plans. After seventh period Jeremy went to his locker and packed the rest of his books in his backpack. Then he went to the northeast corner of the campus, the nearest exit to the Iron Horse Trail, to wait for Lyle. He arrived about five minutes later. Jeremy smiled as well, and he grabbed Lyle in a bro-hug. After a few second he pushed away, holding Lyle on his shoulders at arm’s length. “Congratulations. I’m so glad for you. We ought to go out and celebrate. I’d suggest a Giant George’s hamburger, but now that you’re on the team you can’t eat one of those unhealthy, calorie-laden, fat-clogged, salt-overloaded, but absolutely delicious burgers. So we can walk to Veggie Grill and have something healthy, low-calorie, low-fat, low sodium that is also delicious and will be good for your body.” Jeremy stood there waiting for Lyle’s response. But he didn’t say anything. Finally, Jeremy couldn’t hold it back and he laughed, then so did Lyle. “Actually, that veggie place sounds interesting,” Lyle said. “Absolutely, and at no extra charge,” Jeremy replied. By the time they reached Veggie Grill Lyle had his fingers in his ears, pleading with Jeremy to end his non-stop tour guide blather. But the ‘blather’ was constantly interrupted by laughter from both boys. “Thank you, thank you,” Lyle responded. They ordered and sat down with lemonades and chatted while they waited for their meal to be brought to their table. “Maybe after getting bandaged up he called somebody he knows and they helped him get out of the hospital. Sort of like how he just walked onto the Las Lomas campus,” Lyle said. They were interrupted when the server brought their veggie BLTA sandwiches. “Soy something, I think,” Jeremy replied. “It’s just like real bacon. It’s even crunchy. This is a great sandwich. Lots of avocado. It’s my favorite fruit.” Lyle grinned. “Avocado’s a fruit? Really?” Jeremy asked. They sat and ate, looking out the front window at the people passing by. “See that guy, with the black jacket with a hood?” Jeremy asked. “How do you know it’s yours?” Lyle asked. Lyle got up and grabbed both plates and took them to the front counter to get them wrapped and bagged. Jeremy walked outside and strolled up Locust street following the guy in his coat. The next signal at Cypress Street turned red just as the guy got there. Jeremy stopped just behind him. Just as the signal turned green Lyle stepped alongside Jeremy. They crossed the street and the guy continued up Locust with Jeremy and Lyle following him a few paces behind. They followed him all the way to Civic Drive, and another red signal just as he arrived. “I’ll stand behind him,” Lyle whispered. The guy looked at Jeremy, and when he saw who it was he looked scared. Jeremy realized that he’d seen this guy around school. He looked like he was a sophomore or maybe even a freshman. He was real skinny and the coat was way too big for him. He looked like a young kid, maybe fourteen years old. “Do you wear it to school?” Jeremy asked. “Oh.” Bill teared up, then he started to cry, just tears. “I’m sorry. I’m really sorry,” Bill said as the three boys walked to the bench and sat down. “What did you tell them when you wore this coat home from school?” Lyle asked. “My foster mom asked me where I got it, and I said a friend gave it to me.” Bill looked down. He seemed to be ashamed about stealing the coat and lying to his foster family. “Why do both of you make your lunches?” Lyle asked. “Are there other kids in your foster family?” Jeremy asked. “Then look for me in the cafeteria Monday, okay?” Jeremy suggested. Bill smiled. Jeremy and Lyle both noticed that was the first time Bill had smiled since they started talking to him. “You’re sure you want me to keep your coat?” Bill asked. “Where do you live?” Jeremy asked. “Let’s exchange our cell numbers and email addresses,” Jeremy said. They did that and said their goodbyes. “You okay walking home?” Jeremy asked Lyle. When Jeremy got home he found that the window had been fixed, and there was a bill from the window company. He’d have to send that to State Farm. He hoped it would be covered by the homeowner’s insurance. He also needed to ask how to get the carpets cleaned to remove the blood that was now dried into the fabric. And who would do it. The first thing he did was call Mike. “Okay. Bye, lover!” As usual, Mike started laughing and hung up before Jeremy could respond. ‘I’m going to get him next time,’ he promised himself. Jeremy heated some lasagna he had in the freezer and had that for dinner along with a salad. Then got to his homework. Around seven p.m. the phone rang. The caller ID read ‘Out of area’ so Jeremy’s first thought was that it might be his mom. Too bad, Jeremy thought, it’s not my mom. “I met with the Walnut Creek police this afternoon. The officer who went with Leo in the ambulance stayed at the hospital waiting for Leo to be released so he could be taken to jail. He was called away to help with an unruly patient in the Emergency Department waiting area. When he returned to the room to check on Leo, he was gone. He checked all of the other emergency rooms, but he wasn’t there. He checked all hospital exits and the guard at one of the exits from the main hospital said a man who had bandaged hands left with another man. That other man was in a suit. The officer reported it to his supervisor, and was told to return to police headquarters. They issued an all-points bulletin for Leo. When he was caught in the cafeteria at your school today, they arrested him and took him to the County Jail in Martinez. “Then I met with Dave Morrison in the District Attorney’s office in Martinez. He said an attorney, Eric Cordon, contacted him and said that he’d removed Leo from the hospital, that he wasn’t under guard so he ‘obviously’ wasn’t under arrest. Apparently Leo had called the attorney. With his hands bandaged he must have had someone at the nurses’ station dial the number for him. “That’s a good thing, then?” Jeremy asked. “Or until we find out that she died,” Jeremy said. Jeremy ended the call and got back to his homework. About a half hour later he heard the doorbell. He went to the door and looked through the peep-hole. It was a man in a suit; he didn’t recognize the man. He put the security chain on the door, and opened it as far as the chain allowed. “Are you Jeremy Sievers?” the man asked. “Why are you asking for Jeremy Sievers?” Jeremy asked. Jeremy closed the door, went to his bedroom, and picked up his cell and called Mr. Butler. “I don’t have your office number,” Jeremy said. Roger Butler told Jeremy the office number. Jeremy wrote ‘Roger Butler’ and the phone number on a sheet of letter-size paper. A bit large for such little information, but after he folded it length-wise it would be easy to push through the small space at the front door. Jeremy entered the office number for Roger Butler in his cellphone, then went back to the front door. He opened it, again only as far as the chain would allow. Jeremy heard Eric Cordon shout, “Thank you,” through the closed door and a short time later the sound of a car driving away. He thought about the charges Leo would face, and that seemed to be the end for Leo. Jeremy was glad it would soon be over. Now what he hoped was that his mom would phone him or return. She should if Leo never contacted her again; which, of course, he couldn’t from jail. Jeremy returned to his homework. He wanted it finished so he’d be free for the DVC visit tomorrow and the APUSH study group at Lyle’s house on Sunday. If you enjoyed reading this story, please let me know! Authors thrive by the feedback they receive from readers. It's easy: just click on the email link at the bottom of this page to send me a message. 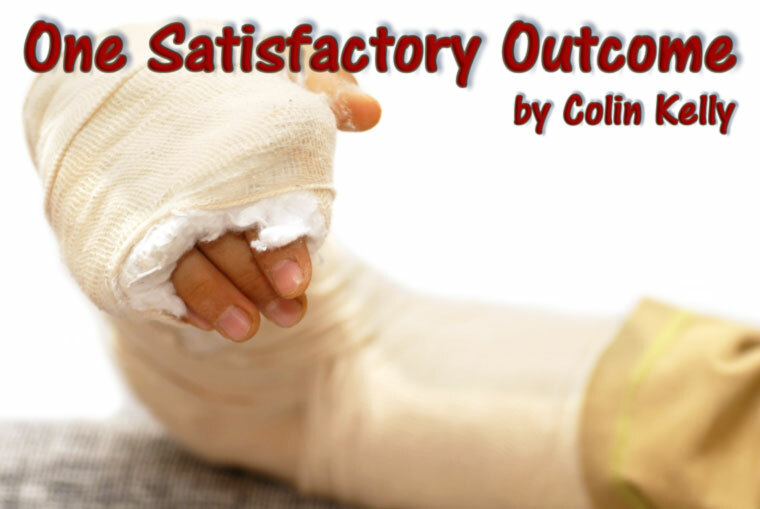 Say “Hi” and tell me what you think about ‘One Satisfactory Outcome’. Thanks. This story and the included images are Copyright © 2016-2019 by Colin Kelly (colinian). The original image is Copyright © Julija Sapic | Dollar Photo Club #37093557. They cannot be reproduced without express written consent. Codey's World web site has written permission to publish this story. No other rights are granted.